The fixture emits downward directed light. The angle of the shade can be adjusted to optimize light distribution. The shade is painted white on the inside to ensure a soft comfortable light. Class: Ingress protection IP20. Electric shock protection II w/o ground. Energy Class A+ - E.
Louis Poulsen is honouring Arne Jacobsen and celebrating the 60th anniversary of his iconic design with a new and dynamic colour universe for the popular AJ table, floor and wall lamps. Colours have a physiological effect on us and stimulate our senses. Colours can be used to separate, organise and label objects. In addition to the black, white and pale petroleum, the new collection consists of 7 colours: dark green, ochre, rust red, midnight blue, aubergine and two grey midtones. The colours are closely linked to Arne Jacobsen’s own universe and have been carefully selected on the basis of how the colours best highlight the essence of the AJ lamp. “The AJ lamps are famous for their sculptural design. The new colour collection consists of both classic and more contemporary tones, which all share the trait of highlighting the design of the AJ lamp itself,” says Idea & Design Director Rasmus Markholt from Louis Poulsen. Arne Jacobsen designed the AJ Table, Floor and Wall Lamps in 1957 for the SAS Royal Hotel in Copenhagen where they constituted an integral part of the design concept of the hotel as a whole. 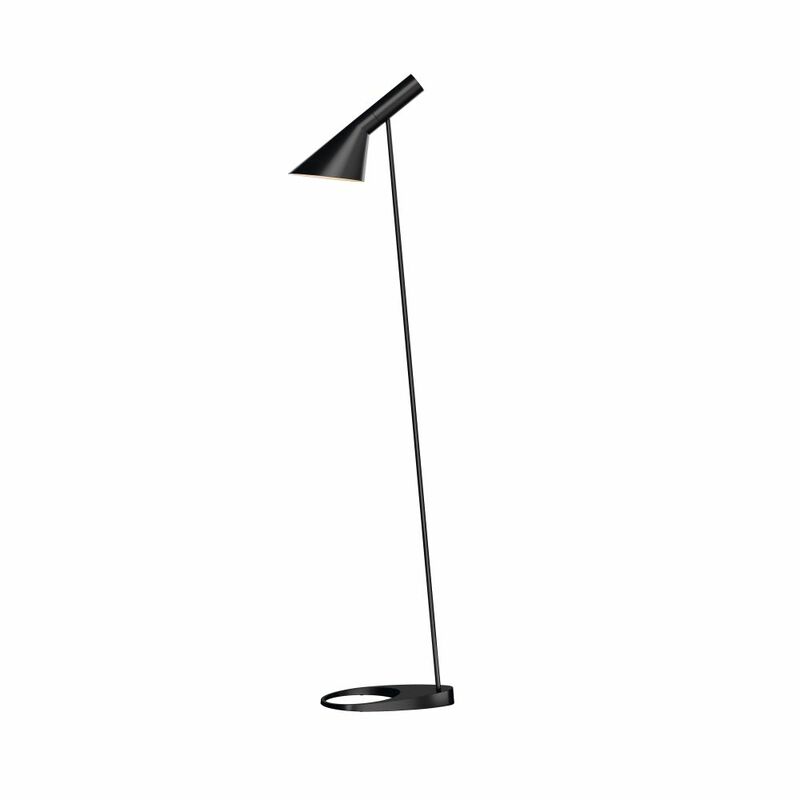 The AJ lamp has since become a world-famous design icon and one of Arne Jacobsen’s most popular lamps. “Arne Jacobsen was an aesthete to his fingertips, and it is no accident that he was often given responsibility for the interiors of the buildings he designed – right down to the smallest detail. He originally dreamed of being an artist before choosing to train as an architect, and his artistic talent and courage clearly shine through in both his unique design idiom and his sense of colour. That is why we feel it is in keeping with his spirit to update the AJ lamps with a range of classic and inspirational colours,” adds Rasmus Markholt. The design of the AJ lamp is based on a shade whose shape comprises two geometric shapes: the cylinder (the socket) and the cone (the shade). The lamp concentrates the light where it is needed, and the design is ideal for use as both a work light and a reading lamp. The unusual angles of the AJ lamp, along with the volume of the shade and the circular hole in the foot, imbue it with a pronounced sculptural quality. The new colours will be available in stores from March 2017. Arne Jacobsen (1902–1971) is one of Denmark’s most famous and renowned architects and designers. He embraced all areas of his profession and succeeded in capturing international trends and making them his own. Arne Jacobsen is recognised as being the great architect of modernism. He was remarkably productive, and over a period of approximately 50 years, he created more than 300 works encompassing all genres of the art of construction. Arne Jacobsen designed numerous buildings in Denmark, Germany and the UK, with the National Bank and SAS Royal Hotel in Copenhagen (1971/60) and St Catherine’s College in Oxford (1963) among his best-known projects. Louis Poulsen is a Danish lighting manufacturer, founded in 1874. Through close working relationships with designers and architects such as Poul Henningsen, Arne Jacobsen, Verner Panton, Vilhelm Lauritzen, Øivind Slaatto, nendo (Oki Sato), Shoichi Uchiyama and Louise Campbell, Louis Poulsen has established itself as one of the key suppliers of architectural lighting in the world market. The company supplies a range of lighting designed for both the professional and home lighting markets. There is a story behind every Louis Poulsen product. These are products whose designers focus on light itself, on the idea behind the product as well as on the refinement of an architect’s, light designer’s or furnishing designer’s ideas and visions about light – all in harmony with Louis Poulsen’s own philosophy, design to shape light.